Normally when I see a Northern Mockingbird (Mimus polyglottos), it is perched in a tree. This past Wednesday at Occoquan Bay National WIidlife Refuge, I spotted one foraging in a field. 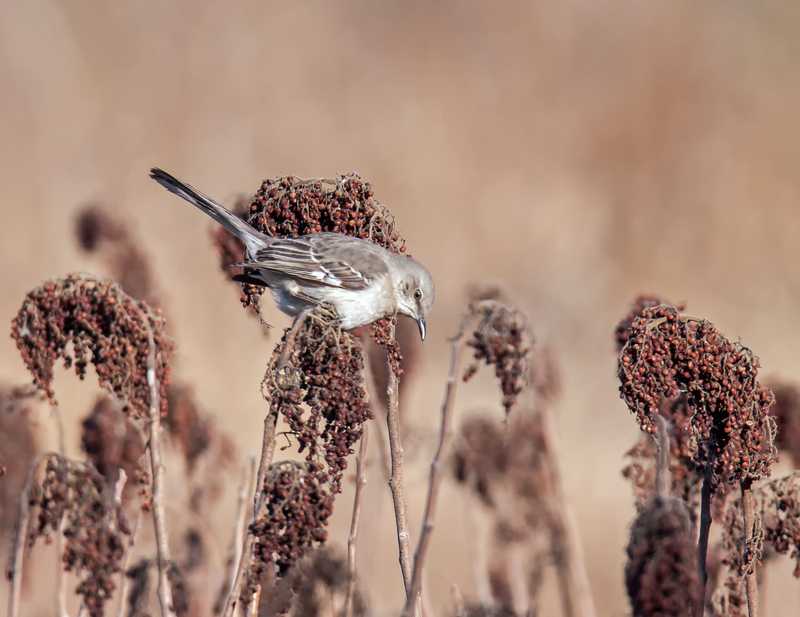 The mockingbird was perched on the stalks of the vegetation and periodically would bend down and grab a few seeds. I love the way that the cooler tones of the bird contrast with the warmer shades of the vegetation and the background. That contrast makes this fairly common bird really stand out and shine. Lovely tones and what a nice sharp shot! This really is interesting. I’ve never seen a mockingbird at a feeder (unless fruit was involved) and I didn’t know they’d eat seeds. Sure enough — they prefer insects, but will feed on fruit and seeds in fall and winter. Maybe this one was feeling a shortage of insects.